A study suggesting the damaging effect of passive smoking on health may have been overstated has sparked a furious row. The study, funded in part by the tobacco industry and published in the British Medical Journal, concludes that the link between environmental tobacco smoke and coronary heart disease and lung cancer may be considerably weaker than generally believed. However, the American Cancer Society, whose data was used, has expressed serious misgivings about the conclusions. 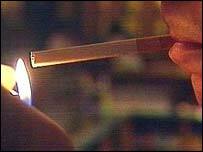 And anti-smoking campaigners have condemned the the research as "biased" and "unreliable". The researchers, James Enstrom of the University of California and Geoffrey Kabat of New Rochelle in New York, analysed data on 118,000 people who took part in a 40-year cancer prevention study in California. In particular, they focused on 35,500 people who had never smoked, but who had a spouse who did. The researchers found exposure to environmental tobacco smoke was not significantly associated with death from coronary heart disease or lung cancer. A spokesman for the American Cancer Society told the BBC the research was "inaccurate and unreliable". But, as expected, active cigarette smoking was confirmed as a strong risk factor for coronary heart disease, lung cancer, and chronic obstructive pulmonary disease. The researchers say their findings suggest estimates that passive smoking may increase the risk of coronary heart disease by as much as 30% are probably inaccurate. However, they do accept that a small effect cannot be ruled out. He said the last time the society checked to see whether the people who took part in the study were still smoking was 1972. So, it was possible that many people had kicked the habit at any time during the last 26 years of the study, which finished in 1998. And those who did continue to smoke may well puff on a cigarette outside their house away from their spouse. The UK anti-smoking charity Action on Smoking and Health condemned the BMJ for publishing a "biased" piece of research. Research manager Amanda Sandford said the authors of the study appeared to be deliberately downplaying the findings to suit the tobacco industry. She said: "Questions will inevitably be asked about the decision to publish research conducted by scientists in the pay of the tobacco industry. "This could be very damaging as it will be used by industry lobbyists to argue against laws to ban smoking in public places and workplaces. "We would urge policy makers not to be swayed by this study but to respect the reputable science that has already shown passive smoking to be a killer." The BMJ said funding for the study had proved impossible to obtain from other sources. In a statement about the two authors of the research, the journal said: "They are both lifelong non-smokers whose primary interest is an accurate determination of the health effects of tobacco." "The decision to publish a paper is only taken after careful consideration and following a strict submission process which includes peer review. "It is inevitable that some research may at times be regarded as controversial." In an accompanying BMJ editorial, Professor George Davey Smith, of the University of Bristol, argues that the impact of passive smoking remains under dispute. He says it is difficult to measure the impact of environmental smoke with any degree of precision, and thus there is a high risk of misleading findings. Dr Ian Campbell, President of the British Thoracic Society, said: "Medical evidence has conclusively shown that passive smoking has a detrimental effect on children's lungs and there is also good evidence that suggests that passive smoking worsens the effects of asthma. "Further research into the effects of passive smoking on lung health are needed and should be encouraged by governmental and other funding agencies." Dr Campbell added that the findings of a study carried out in California would not necessarily be replicated elsewhere. "In California the weather is good, and many people have an outdoors lifestyle. It may be a little different if you live in a tenement block in East London or Berlin." Dr Vivienne Nathanson, the BMA's Head of Science and Ethics said: "It would be wrong to be swayed by one flawed study funded by the tobacco industry when set against the studies and numerous expert reviews that demonstrate that passive smoking kills." But Tim Lord, chief executive of the Tobacco Manufacturers' Association, said: "The debate on environmental tobacco smoke is far from over, contrary to what many people say. "Taking the evidence as a whole, the inevitable conclusion is that claims made about the potentially harmful effects of passive smoking have indeed been overstated." Analysis of urine samples has indicated that people who are married to smokers are exposed to around 6% of the dose that is received by an active smoker. "Researchers found no evidence of extra deaths"
Is passive smoking a killer?